This Raleigh utility model is ideal for sidecar duty. One of the main selling points of a bicycle sidecar chassis was that it was so easy (once the actual sidecar itself is removed) to fold the chassis into the bicycle for access and storage. A commercial sidecar outfit could be used for business during the week. But, at weekends, it could be ridden for pleasure, ie either solo, or with a children’s sidecar body bolted onto the chassis. Observe the two options for sidecar bodies in the advert above. This mirrored how motorcycle sidecar outfits were used at the time. Having a dual-purpose vehicle was a very economical option – bear in mind that, in 1933, the country was just starting to come out of the Depression, and it was a priority for manufacturers to provide economical vehicles. This particular outfit is set up for a removable luggage trunk for train journeys. 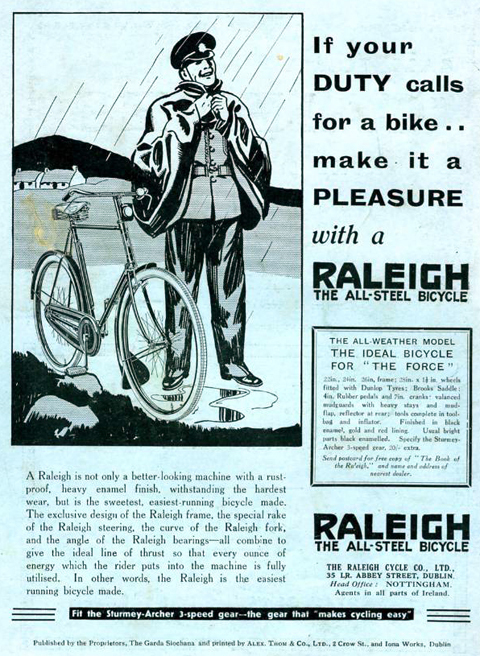 This is a rare early 1930s Raleigh All-Weather with wide valanced mudguards. This heavy-duty model was supplied to Police forces in Great Britain and Ireland. The chain-guard was an extra that was often removed. It afforded the rider protection from grease, but if you had to fix the chain it took longer. This Raleigh sidecar outfit is fitted with a railway trunk. These photos were taken at Brighton station which, as you can see, has not changed all that much since 1933. The label on it shows its use between Brighton and Victoria. The trunk is of lightweight construction, so does not add extra weight when pedalling. It was manufacturered by D.H. Evans of Oxford St, London. The leather carrying handles are solid and you can use them to lift the travelling trunk. If you look at the guarantee, below, you’ll see that it is still valid!